Haigh are an established name in the provision of quality disposal technology to the UK health sector. Constant innovation and development of the very best disposal solutions for single use bedpans and pulp products have built strong partnerships with healthcare providers across the UK. Whilst the brand remains strong, in such a highly crowded and competitive media marketplace, creating and retaining off page impact and front of mind positioning is no small feat. We proposed a fresh new media strategy which moved away from the traditional feature-benefit led propositions to a more emotive and reassuring tone - effectively creating a 'pause' amongst the noisy claims and ad slogans traditionally used. Powerful and memorable, Trust the Experts has been used to introduce and sign off the many touch points that customers have with the Haigh brand. From first enquiry to sales visit, to installation and after sales support and coaching, the Haigh proposition is 'felt'. The message has been taken to market through an integrated communications campaign which includes print and digital media, sales and technical collateral and on-site support. The campaign focuses on a proposition which can be delivered and experienced through interactions with the brand and which gives consistency and personality across all tactics. 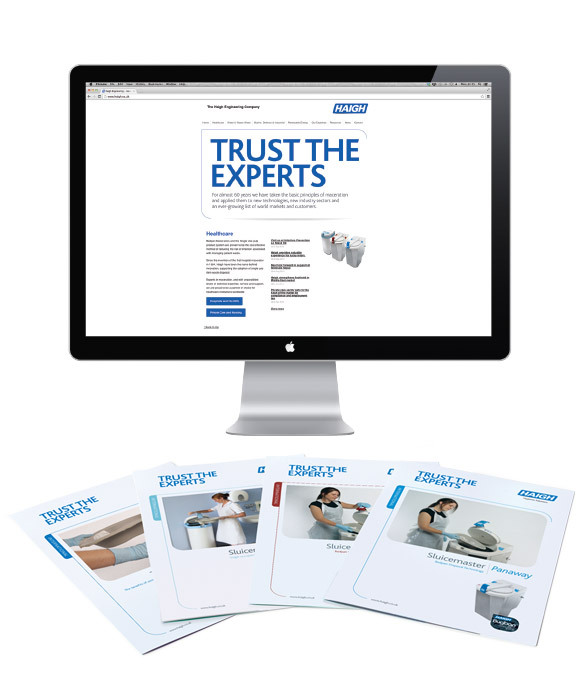 Trust the Experts has become the rallying call throughout all of Haigh's media and communications support. Chosen as a result of direct feedback from their customers, 'Trust the Experts' perfectly wrapped up the positive associations that Haigh's customers felt they delivered; partnerships, guidance, expert technology and total peace of mind. Nick Dale, Sales Manager comments "We very often find ourselves in a sales position where we are asking new customers to change a process - notably from a washing solution to a disposal solution. Whilst the benefits of this are proven, we also appreciate that our customers want a visible and felt supply partner to support and guide them with installation advice, training and wider services. With this in mind, our expert message truly reflects the consultative approach we take to all of our customers."